How does it sound when I say you should try real street food in a genuine place? For quite a while I was thinking I wasn’t going to write an article about Überness because I like the food here as much as I like its location. But because you use Spotted by Locals to find small gems like this, I present you Überness. 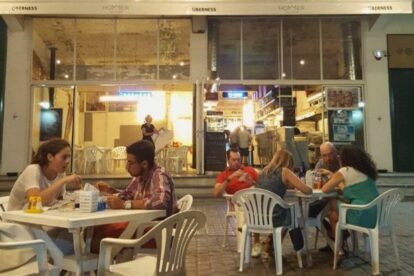 Überness is located at the Central Market of Athens, which is not at all a mainstream tourist area, but you can take it easy since it’s about a 10 minute walk from Moschato metro station. This canteen replaced three butcher shops and it has only cheap plastic chairs and tables. The menu is short but delicious: hot dogs, crispy pork belly, fried chicken and the crazy fried XXL croissant full of chocolate. They sometimes organize cocktail parties, special nights and DJ sets here. A visit to Überness is definitely worth it, at least for one hot dog in their front yard.